Seavest sells Patient Care Centers at Inova Fair Oaks near Washington, D.C.
FAIRFAX, Va., and WHITE PLAINS, N.Y., April 3, 2019 – Seavest Healthcare Properties LLC has sold two medical office buildings (MOBs) on the campus of Inova Fair Oaks Hospital in the affluent Washington, D.C., suburb of Fairfax. The transactions closed March 28, 2019 and the buyer was Healthcare Realty Trust, a Nashville, Tenn.-based real estate investment trust. Jonathan Winer, Chief Investment Officer of the White Plains, N.Y.-based real estate investment firm, said that after Seavest acquired the buildings at 3650 and 3700 Joseph Siewick Drive in separate transactions in 2016 and 2013, it invested more than $1.7 million in renovations. Capital improvements included upgrading the buildings’ lobbies, restrooms and common areas, updating the mechanical systems, and completing a newly renovated clinical timeshare suite. 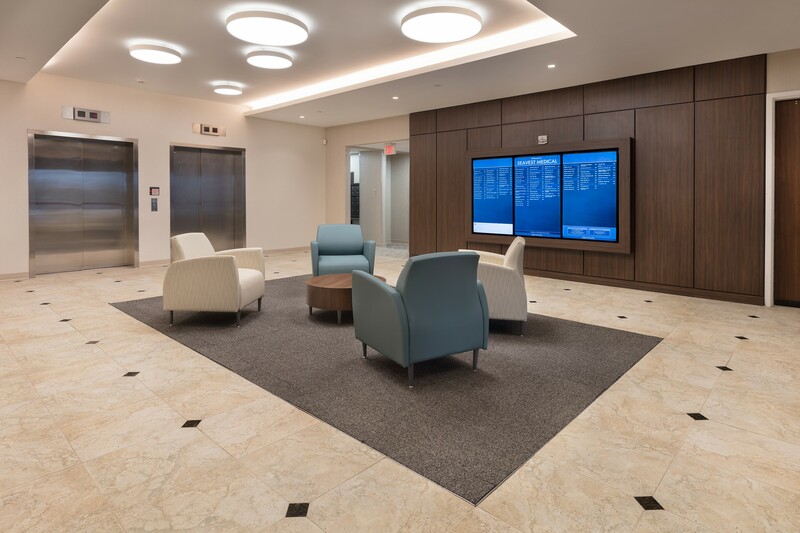 Malika Basheer, Seavest Vice President, added to better serve the tenants and their patients, Seavest also rebranded the two adjacent properties as a single outpatient healthcare destination: The Patient Care Centers at Inova Fair Oaks. The four-story buildings, which total about 160,000 square feet, house a diverse but complementary range of tenants. These include Inova Fair Oaks Hospital and Fairfax Family Practice Centers, as well as primary care, clinical skin care, ob-gyn, vascular surgery and urology specialty practices. Avison Young, a commercial real estate services firm headquartered in Toronto, Canada, brokered the sale for Seavest. The Avison Young team was led by Jim Kornick, Chip Ryan and Michael Yavinsky, Principals, and Georgiana Condoiu, Vice President, in Avison Young’s Washington office; as well as Mike Wilson and Erik Foster, Principals, and Mark Johnson, Executive Vice President, in the firm’s Chicago office. Seavest Healthcare Properties LLC is a real estate investment manager focused on the medical office and outpatient facility sector. The firm acquires existing properties, joint ventures with established developers to build new properties, and asset manages medical office buildings, outpatient facilities and similar healthcare real estate assets. A pioneer in this sector, Seavest made its first healthcare real estate investment in the mid-1980s. Today, the firm has a significant portfolio of medical office and outpatient properties located throughout the United States. For more information, please visit www.SeavestHCP.com or call (914) 683-8474.